PALMER: “We All Hate Pittsburgh”..Week 6 Preview and Prediction | "IT'S A STEELERS WORLD"! Words come back to haunt. Well, I was about to give the Arizona Cardinals a slight “pass” on reaching into the Sunday’s game versus the Pittsburgh Steelers as deep as I had planned. 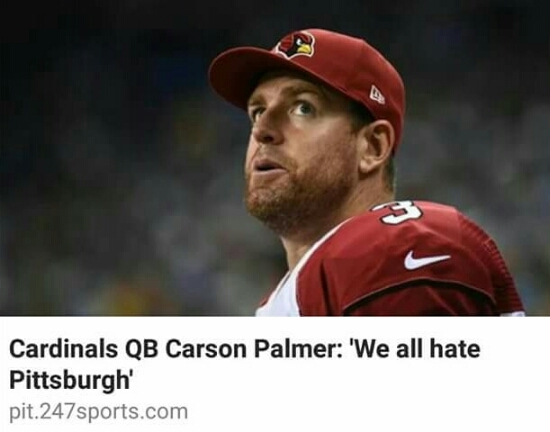 But thanks to Cardinals quarterback, Carson Palmer’s statement nine years ago..I am about to rekindle the flames and go “Elbow Deep” in their asses! Nothing like a former Cincinnati Bengals quarterback, who could never prove his worth in the AFC North to flap his yap. Maybe it’s because he is still bitter about former Bengals..then Steelers, Kimo Von Oelhoffen “very legal” hit placed upon him in the 2005 Wildcard Playoff Game. Maybe it’s because he was lucky enough to make it out of the NFL’s Retirement Home also known as..the Oakland Raiders. Or maybe he is just stupid. Look, I understand that the Cardinals are sporting a pretty nice 4-1 record in their division and are one of the teams to beat in the NFC as of now. “But come on..who have they really beaten”? The New Orleans Saints (2-4)..the Chicago Bears(2-3)..the San Francisco 49ers(1-4)..and the Super Duper NFC Powerhouse, Detroit Lions (0-5). That covers the four wins..but the one loss? Losing 24-22 in week 4 to the Saint Louis Rams. You know, the same Saint Louis Rams team in week 3 where Ben Roethlisberger went down..Mike Vick came in and the Steelers won 12-6? Yeah..those Rams. Sure, the Cardinals are averaging 38.0(1st) points per game, rank 3rd in rushing(134.8) and 10th in passing(258.2) but I ask you once again..”who have they beaten”? Because going up against a constant improving defense in the Pittsburgh Steelers is going to prove more difficult than the Cardinals or any “so-called” experts could imagine. As far as the offense is concerned? Mike Vick and Company are doing just enough of what it takes to eek out their wins. With Vick remembering what it was like to make defenses look incompetent after his 72 yard touchdown pass to receiver Markus Wheaton, followed by a much needed 24 yard scamper in the closing minute of the San Diego Chargers game. I think that coach Mike Tomlin and offensive coordinator, Todd Haley know what kind of a weapon they have. Not to mention, in the words of the immortal Tony Stark..(Ironman)..played by one amazing actor, Robert Downey Jr..(with a little AdLib by me of course).. “You have an Army..We Have a LE’VEON BELL”! A Bell who would love nothing more than continue his reign of terror upon opposing defenses. Oh yeah..Antonio Brown, Martavis Bryant, De’Angelo Williams, Markus Wheaton, Darius Heyward-Bey, Heath Miller, Mike Vick..(Patrick Peterson can’t cover them all)..shall I go on? How many offensive weapons do you possess, Palmer? Right..Larry Fitzgerald. Cannot wait until Antwon Blake lays a smacker on him. Or rips a pass from his clutches for another “Pick 6”. So have fun avoiding the likes of James Harrison,. Lawrence Timmons and a newly revamped 1st round draft pick, Alvin “BUD” Dupree on Sunday afternoon Mr. Palmer. Because saying..”WE ALL HATE PITTSBURGH”..might have not been the wisest decision.